WRIGLEY. 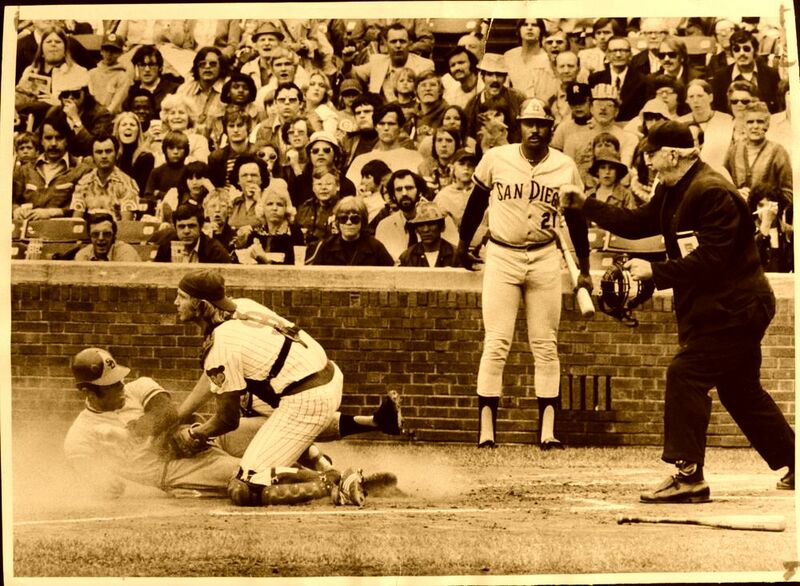 This photo of the Padres playing the Cubs at Wrigley Field is great; even though the call did not go San Diego’s way. One thing that puzzles me though, is that I can’t figure out who the player sliding into home is? Based on uniforms, I’m lead to believe that this photo was taken in 1974 or 1975 and the player in question is either Jerry Turner, John Scott or Bobby Tolan. If anyone knows for sure, definitely let me know. One thing I do know is that the catcher is future-Padre, Steve Swisher and that’s obviously Cito Gaston standing in the background. On July 19th, 1982, Tony Gwynn made his major league debut, in a game against the Phillies at Jack Murphy Stadium. Pete Rose, who was playing first base that night, met Tony at second base after his first major league hit. Rose congratulated him and jokingly said something along the lines of “Don’t catch me in one night.” This may be a well known story, but I still don’t think I’ve ever seen video of his first hit, let alone his interaction with Rose. 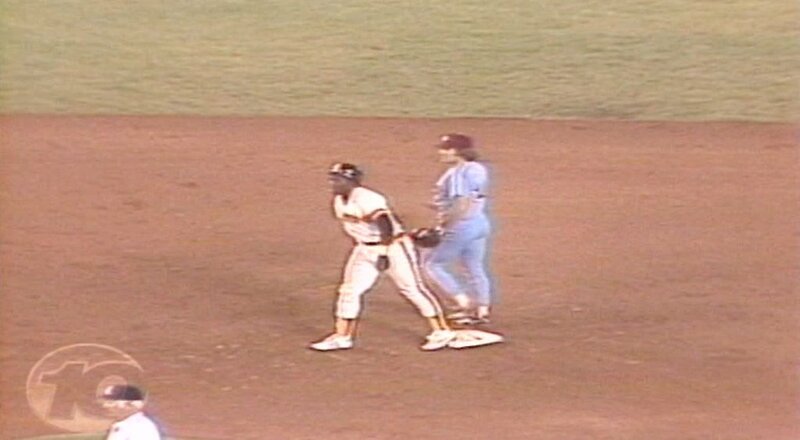 Needless to say, I was happy when @BenHigginsSD shared this screenshot on twitter earlier this year, which captures Gwynn right after he rolled into second base with Rose right behind him. Gwynn had 5 at-bats that night and didn’t even get his first hit until the bottom of the 8th inning, against Sid Monge, who would later be his teammate in 1983 & 1984. Tony later came up again in the bottom of the 9th, where he hit a single against Ron Reed. An interesting thing about Reed is that just like Gwynn, he was also a college basketball star who got drafted by an NBA team. I can’t imagine there being an incredibly long list of MLB players who were also drafted by NBA teams, so this caught my eye. With that said, unlike Gwynn, Reed actually pursued professional basketball and played for the Pistons during the ’65/66 & ’66/67 NBA seasons. Gwynn went 2 for 4 that day and all three of the balls he successfully put into play (sacrifice fly, double and single) were hit to centerfield. Both of his “unsuccessful” at-bats took place against Sid Monge and resulted in a lineout to the shortstop and a strikeout. Not a bad day for 22 year old kid making his major league debut. I recently came across this photo and it warmed my heart, as it captures two of the most beloved individuals in organizational history. Tony Gwynn, Mark Grant and Padres brown?? it doesn’t get much better than this! This entry was posted in San Diego Padres and tagged 1984 San Diego Padres, Bobby Tolan, Chicago Cubs, Cito Gaston, Jack Murphy Stadium, Jerry Turner, John Scott, mark grant, Mark Grant Padres, Mike Krukow, Pete Rose, Philadelphia Phillies, San Diego Padres, San Diego Padres Hall of Fame, Steve Swisher, Tim Flannery, Tony Gwynn, Wrigley Field by duaneharris19. Bookmark the permalink. I just showed Cito Gaston this picture of him at Wrigley and he said he thinks the guy sliding is Nate Colber. Thanks for asking Cito about this! I will add a note during my next update.